Steel power car built by Commonwealth Engineering for use on the narrow gauge Ghan service. 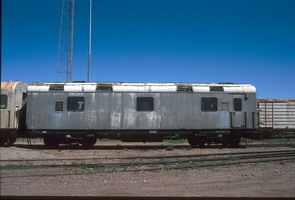 3.5.1968 Entered service on the Central Australia Railway as "NGA 81". 12.1980 On the last Ghan. 16.7.1983 Converted to standard gauge and coded "VGC 395". 1.11.1997 To Australia Southern Railroad. - Painted in corporate livery of Orange and Black. - Sent to Western Australia to be part of Australia Southern Railroad Inspection Train. 15.10.2003 Left Western Australia for Dry Creek, South Australia. [cp 11.2000]. 15.10.2003 Left Dry Creek on an Inspection Train bound for Darwin. At the completion of Inspection, returned to Dry Creek, South Australia [cp 11.2000]. 5.2004 Sold to South Spur Rail Services for use on the "Spirit of the West" Restaurant Train.